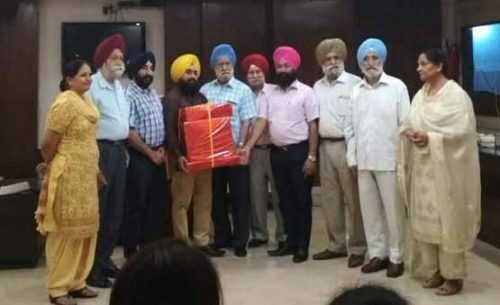 Chandigarh : Gurdev Singh Gill awarded best teacher on teacher’s day by the school managing committee of Sri Guru Gobind Singh Senior Secondary school, Sector 35, Chandigarh for his outstanding contribution in Academic and non Academic works. Chairman S. Tara Singh, Manager S. Surinder Singh, Social Activist Paramdeep Singh Phabaat, Senior managing committee Members S. Gurjot Singh Sahwney, S. Amrik Singh are also present in the function. Principal Mrs. Harjit Kaur Motivated the whole staff for their important contribution as nation builder’s.